Although many patients have no problem wearing an upper denture, some people find it difficult to wear and eat with lower dentures. 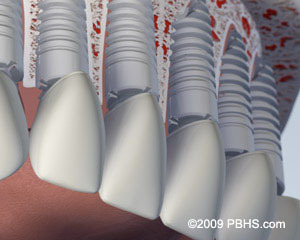 Several implant assisted replacement options are available if you are missing all of your lower teeth. A wonderful solution for a loose lower denture is to have two implants placed in your lower jaw and a denture fabricated to snap onto these implants. 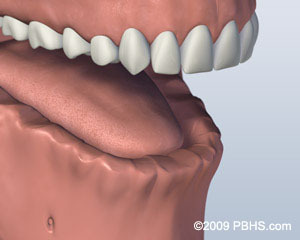 This is known as an overdenture. The lower overdenture option limits movement, increases stability and provides increased chewing support over your conventional denture. 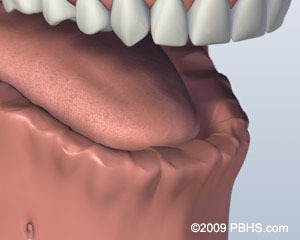 While there will still be movement of your lower denture, it will be significantly reduced and completely controlled. 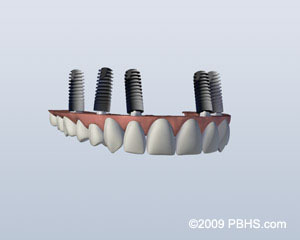 Another overdenture option involves placing two or four implants and connecting them together with a custom milled support bar. Your denture will be made with special internal attachment clips that snap onto the support bar, keeping the denture firmly in place. The advantage of this option is that it is much more stable than the first, ball attachment overdenture as it eliminates nearly all denture movement. Yet, your denture is still removable for easy cleaning and maintenance. 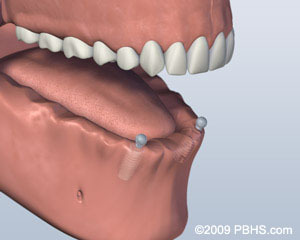 For a totally fixed option we can use four implants in your lower jaw and attaching a fixed denture bridge. Your bridge is fixed in place and can only be removed in the dental office if needed for unusual maintenance. 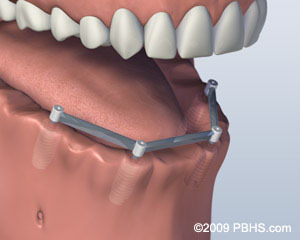 This fixed bridge will replace all your missing lower teeth. Dr. Sharifi is able to fabricate this bridge with acrylic, composite, zirconia and ceramic options. The different materials impact durability, esthetics, maintenance and cost. Contact our office to discuss these solutions for your dental concerns. The final option is to have all your teeth replaced so that they will appear to be growing out of your gum tissue and will most closely resemble the appearance of your natural teeth. This option requires eight implants. 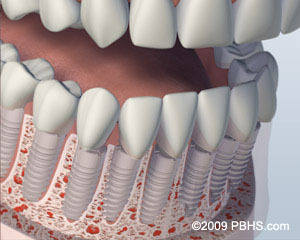 Ceramic bridges are made in multiple short-span sections for cleansibility and ease of maintenance. This is the most natural appearing result when you are missing all your teeth in the lower arch. A similar range of treatment options is also available for your upper jaw. However, because the bone is not as hard as that in the lower jaw, we often require one or two additional implants to support their new replacement teeth in the upper arch compared to the lower arch in the same patient. Depending upon the number of implants to be placed, it may be possible to eliminate the need for covering the roof of your mouth with a complete denture. Doing so allows you to fully taste your food and gives you a better sense of its temperature. This solution will feel more natural. You will still have a removable denture, which makes cleaning the support bar and denture much easier. Need a section for upper OD with Bar. With four or six implants properly dispersed in the upper arch we can connect them together with a custom milled support bar. Your denture will then be fabricated with special internal locking attachments that lock into the support bar, keeping the denture firmly in place. This overdenture option does not cover the roof of your mouth. This openness will allow you to more fully taste your food and provides you with a better sense of temperature. Your denture will feel much more natural this way. Another advantage of this option is that it eliminates nearly 100% of all denture movement. Yet, your denture is still removable for easy cleaning and maintenance. 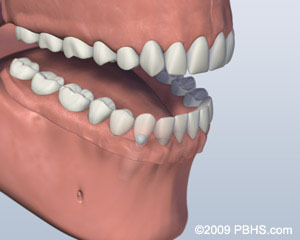 For a totally fixed option in the upper arch we need to use use four to six implants to attach a fixed denture bridge. Your bridge is fixed in place and can only be removed in the dental office if needed for unusual maintenance. 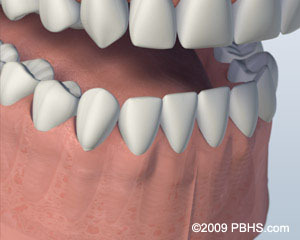 This fixed bridge will replace all your missing upper teeth. Dr. Sharifi is able to fabricate this bridge with acrylic, composite, zirconia and ceramic options. The different materials impact durability, esthetics, maintenance and cost. Contact our office to discuss these solutions for your dental concerns. With four or six implants properly dispersed in the upper arch we can fabricate an overdenture that does not cover the roof of your mouth. This openness will allow you to more fully taste your food and provides you with a better sense of temperature. Your denture will feel much more natural this way. You will still have a removable denture, which makes cleaning the support bar and denture much easier. The final option is to have all your teeth replaced so that they will appear to be growing out of your gum tissue and will most closely resemble the appearance of your natural teeth. This option requires eight implants. 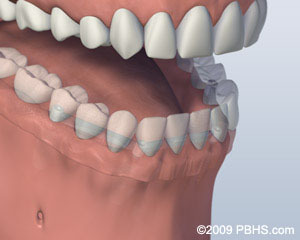 Ceramic bridges are made in multiple short-span sections for cleansibility and ease of maintenance. 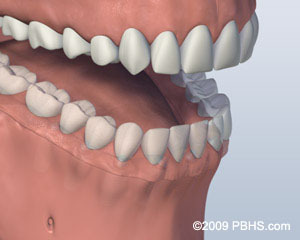 This is the most natural appearing result when you are missing all your teeth in the upper arch.